Brothers CW, WT and JB Kitchen built the first Paxton Hotel for about $250,000. They named it after Omahan William Paxton, a frontier entrepreneur active in cattle production, railroading and freight. Among some of the prominent guests who stayed at the Old Paxton were “Buffalo” Bill Cody and William Jennings Bryan. A most intriguing event associated with the original Paxton was the murder of Harry King, son of the millionaire owner of Browning, King & Co. men’s apparel store in Omaha. King’s mistress, Elizabeth Bechler, fired two shots at him as he walked away from her in the hotel lobby. President McKinley stayed at the Paxton during the Trans-Mississippi Exposition. The Paxton served as the headquarters for three political parties: the Bull Moose, Democratic and Republican. Such dignitaries as Presidents Woodrow Wilson and Theodore Roosevelt registered as guests in 1912. 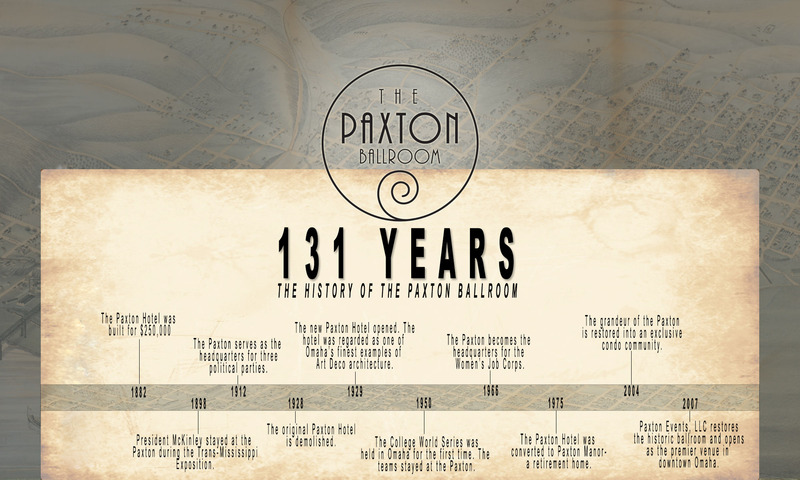 The first Paxton Hotel was demolished to make way for the grand structure that exists today. It took four weeks to raze the Old Paxton. Eight months and $1.5 million after demolition, the new Paxton Hotel opened. The hotel was regarded as one of Omaha’s finer art deco buildings. The carpet in the lobby is said to be the largest ever used in any hotel at that time. The interior design was by Marshall, Field & Co. of Chicago. Features included 420 rooms, four dining rooms, a barbershop and a ballroom, plus modern amenities such as elevators, telegraph and cable services, and even a rooftop dog kennel with runways. Room rates started at $2.50 a night. The Kitchen brothers sold the Paxton to Joseph Huckins III. The sale was regarded as the largest real estate deal ever to take place in Omaha at that time. The College World Series was held in Omaha for the first time. The teams stayed at the Paxton. Color television was displayed at the Paxton and broadcast nationally. The Paxton boasted air conditioning, a package liquor store and grill room. Throughout the 1930’s and 1940’s, the hotel hosted the big band sounds of Paul Moorhead, which were broadcast weekly on coast-to-coast radio. The Paxton stopped operating as a hotel and became the location of the Women’s Job Corps. The Paxton became a hotel once again. Decorated in a “traditional Mediterranean” style, the hotel featured carpeting on all floors and smoked glass mirrors on the lobby walls. Virtually every square inch of the hotel was refurbished, with the exception of three large murals in the lounge. The murals, painted by Nebraska artist, Leonard Thiessen, were part of the original hotel built in 1929. The Paxton hotel converted to Paxton Manor, a self-care retirement home. The grandeur of The Paxton is restored into an exclusive condominium residential community with attending shops and offices. Paxton Events, L.L.C restores the Historic Paxton Ballroom to its original grandeur and reopens the Ballroom as the premier venue for social, charitable, and business events in Downtown Omaha.